Canal-front house, quiet and in the nicest of neighborhoods (Plantation Key Colony). Situated on the bayside on Mile Marker 90. 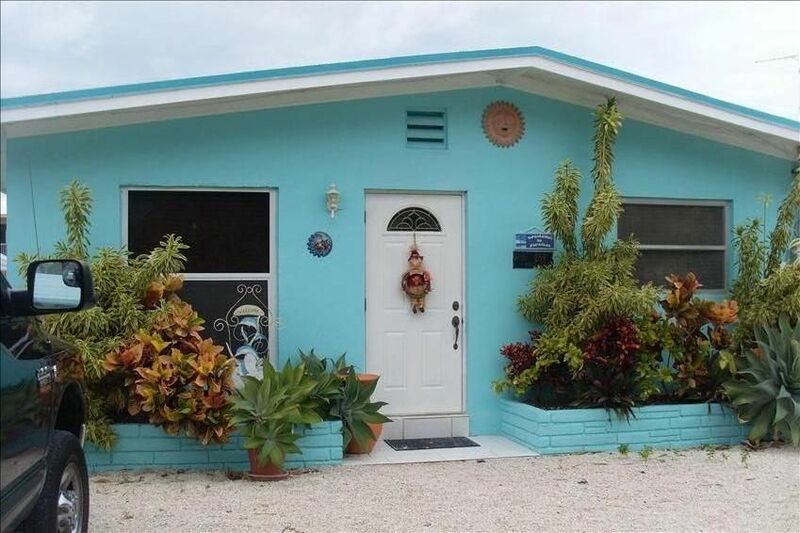 All remodeled,white tiled floor, furnished in wicker/rattan and decorated with the ocean & beach ambiance in mind. Boat dockage in the back and easy access to few boat ramps within walking distance from property. Backyard has everything: Facing deep water canal, a New Tiki Hut with bar, gas stove,gas barbecue, refrigerators, and TV in the bar. Dockage space for up to 40 ft boat. Fishing from the backyard!! Plenty of parking space for your boat trailer, & cars. Refrigerators (outside bar/inside), full kitchen with all appliances, washer and dryer, three full baths (one outside (pool area)and two inside). Master bedroom with a king bed and 25' TV. Second bedroom, two full-size beds plus one bunk bed (twin)+ 25' TV. Spacious living room area with a Flat screen TV/DVD&VCR,music entertainment center.Relax in our new Tiki Bar, and enjoy our new 15ft above the ground pool. Boat access, parked right outside the property, beach close by, in the best area of the Key, just central to all exciting outdoor adventures and close to Miami our home town. Mercy and Jose' were great hosts Whatever we needed they were there The house had everything including spices We love to cook and sit outside under the tiki hut (on the canal) The home is in a great location and easy access to grocery, restaurants, and shopping We will definitely go there again Wonderful stay!!! Mercy is great to work with, her communication is great and she is kind. It's easy to see that she and her family have put a lot of time and effort into making their Keys home warm and welcoming for their guests. This house had everything we needed, plus more. The beds were clean, comfortable, and spacious. We really enjoyed the back yard. The kids loved the pool, the hot tub was nice, there was plenty of seating and plenty of ways to relax and have fun, all without leaving the back yard. We especially enjoyed watching the iguanas, fish, jelly fish, and especially the manatee in the canal. My children all agreed this was the best place we have ever rented. The house isn't huge, but we never felt cramped. I highly recommend this place to anyone who wants a peaceful keys vacation. We stayed in Mercy's home in November and couldn't wait to return. We were able to get away for a another week and enjoyed ourselves very much. Their home is very welcoming clean and comfortable. We hope to return again someday. Perfect for our family! Everything as described and very clean. This is the only way to visit the keys. The house was great, kept very clean, no smells; the backyard, absolutely fabulous! Beds were very comfortable, nice pillows. The kids' bed and bath had plenty of room for our 3 teens to live and relax, with the 3 beds and a futon to sit on too, way better than a hotel. The kitchen was fully stocked with everything you need to cook your meals, including spices. :) Everything worked, spa was great, outdoor TV, pool was very clean and beautiful. Location was excellent, we were close to everything, groceries, restaurants, huge park, and all activities; snorkeling, fishing, beaches, even the drive to Key West for sunset dinner was not too far. Thank you Mercy for keeping such a welcoming home! Boating, snorkeling and fishing all within few miles from home.